Taking a moment to share some warm sunshine, sweet mandarin oranges, and the best part of my day with you! Bright green twigs with leaves still attached are signs of careful picking and freshness. Tonight a few will be squeezed over grilled chicken & tossed in a green salad. I’m headed back outside to enjoy the sun & another mandarin or two. I hope you’re having a great day & looking forward to a blessed weekend! As you celebrate Easter & Passover. A personal note added to a previous post! This morning I received the latest news from luxury stationer William Arthur. Their creative blog, to which I subscribe, is penned by a good friend & keeps an educated audience while discussing sartorial stationery, salutations, and many other interesting topics pertaining to their pretty papers. This morning she highlighted a Vera Wang Opal Tulle Pocket with Oyster White Invitation which is inspired by one of the dressmaker’s wedding gowns. Their creative pairings of paper and fashion instantly reminded me of the book Paper Illusions by Barbara and René Stoeltie. Isabelle de Borchgrave brings long-lost fashions to life through an intricate process of tailoring, crumpling, braiding, pleating, and painting paper. “Inspiration comes in many forms." Speaking of inspiration ~ My mother is an artist. On canvas, in the garden and in everyday life she inspires me and anyone who comes to know her ~ if they can keep up with her! Today she received an early birthday surprise. A few of her dear & inspiring friends took her to lunch and a lecture/slideshow at The Phoenix Art Museum. Guess who was lecturing? What a fabulous artist. What great friends. What a fun day! 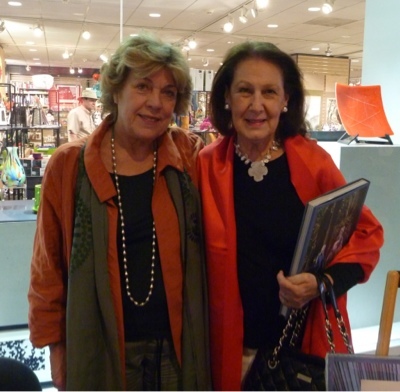 Afterwards Isabelle de Borchgrave was signing copies of her book and was kind to pose with my mom for a birthday picture ~ Thank you Isabelle! Hope you're having an inspirational week too! The creative folks at Artifact Uprising have a message. They believe that everyone has a story to tell and that there’s more than one way to tell it. Have you ever thought of taking all those original photos & beautifully written stories that you spend weekends composing & preserving them in something like ~ a book? Artifact Uprising will show you how to move your story & your life off of your screen and onto your coffee table, bedside table or the lap of a loved one! Come on all you creatives, artists, photographers, designers, bloggers, do-ers & thinkers ~You need to leave a legacy that is archived for future generations. This is what Artifact Uprising is all about! Their signature book is beautifully bound and features your choice of a full-sized or partial dust jacket over a fabric cover. Starting at just $69 for a 50 page book, these books are available in three sizes starting at 50, 100 or 150 pages. You design everything. The shape, color, size, fabric, font, everything. Their online project design tutorial is so simple. Artifact Uprising is also iPad & tablet friendly. Are you more of a softee? Featuring a textured eggshell matte cover, their soft bound books are just as beautiful and start at just $10.99 for a 40 page book! Do you need a layout that better fits the crop of your photo? You can make your own layouts by using the blank layout option available in all of their books. Artifact Uprising is Instagram friendly! These softcover book layouts are designed with your Instagram images in mind. Upload all your favorites and design in just minutes with layouts suited for small square images. They like Instaport. These books are available in two sizes (5.5x5.5" and 8.5x8.5") and start at just $10.99 for 40 pages. Artifact Uprising is ready whenever you are. Oh yea, you can find them here on Instagram too. All Photographs and Information courtesy of Artifact Uprising. I am beyond thrilled to tell you that Stylist and dear friend Coty Farquhar has graciously included my Kentucky garden in her Spring Issue of Styling magazine! She is celebrating interesting women around the world, the color green and as always, living each day with an open heart. Thank you so much Coty for including me! Let’s face it, they don’t always flow. Sometimes I have to be patient and take my time. Time to consider, time to reflect, time to clean out the cobwebs. It’s easy to write about what everyone is talking about. It takes time to emerge and be authentic. Writing rituals ease me into the creative flow. These rituals begin in a quiet comfortable place. I bring along my notebook filled with good humor & grace, meditative thoughts & marvelous ideas ~ My iPad, my favorite writing pen, a pile of dog-eared books & magazines and I’m ready to settle in. I should mention that during this time I’m seldom ever alone. One page leads to another ~ hours pass and I often find myself in the company of saints. Authors, poets, photographers, gardeners, designers, bloggers, survivors, mothers, daughters, mentors and friends ~ Each of whom has their own authentic voice and what seems to be a special message just for me. I’m incredibly inspired by the work of their hands, their hearts, and their minds. We’d all love to know. Where does your jewelry land? The special pieces that you want to have on hand. Do you tuck them away or keep them on display? Do you use a jewelry box or have a secret hiding place? I remember my mother, my aunt, and my grandmother all having beautiful jewelry boxes. They were made of wood and covered in leather with gold decorative accents. Open them up and they smelled of Norell, Joy, and Chanel. They had many compartments & velvet lined trays with dividers for everything imaginable. I remember as a little girl, spending hours coordinating clip-on earrings with cocktail rings and imagining where I would wear them all! These days, I’m doing good to remember a watch and rather than a jewelry box, I choose more creative ways of displaying the pieces I wear most often. This is more my style. I’m not using photos of my own jewelry, so I thought I’d share the many beautiful ways in which others display their favorite pieces. Starting with this personal photo that my dear friend and high school classmate Ann has so graciously shared. “While visiting (and sorely missing the company of) one of my daughters in Newport, I snapped this photo of her bedside in our hotel as my souvenir....reminding me of her essential spirit.” Thank you Ann for sending this along. She’s a beautiful spirit & so are you! Which would you choose ~ a tray or a tree? I love the photo below of boutique owner Jessika Goranson’s dressing table. A tiered server, mirrored tray, and small porcelain saucers serve as resting places for her assortment of jewelry along with the more traditional stack of leather boxes. See the rest of her charming upper east side apartment in the latest issue of Lonny. For the gal who likes to color coordinate her beads & baubles, even when she’s not wearing them, an antique wood dresser complete with drawer organizers becomes the ultimate jewelry box! For the more understated. A goblet or small sterling dish will do. For others, a pretty mirror serves two purposes. Sarah Yates who authors A House in the Hills turned a tangled mess into a “dream system” that she say’s even Martha would be proud of. She might enjoy this ultimate travel jewelry case from Clos-ette Too ~ it’s as chic as it is functional. For organizing just about anything anywhere, The Container Store. And for the girl who’s loyal to the old fashioned jewelry box there’s always a find at Etsy.